Get the CELPIP score you need in a matter of days. Are you looking for a high CELPIP score? Then welcome dear CELPIP candidates to your online preparation platform. Please make yourself at home and if you have any question or clarification about any task or any detail, leave your question in a comment under any particular article or send me an email in the contact page. This website is specifically designed to make sure you get the material you need to get well prepared for your upcoming tests. I know that many of you find difficulties in some modules, especially in speaking and writing. I tried to make it easier for you through some articles and tests that you can easily find. Your comments and recommendations are much appreciated as they would definitely contribute in the progress and development of this platform. 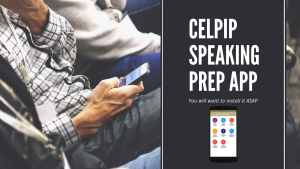 Here you can find many useful articles that will lead you to get the CELPIP score you need. You will find some strategies, tips, and guidelines on how to answer each task in the speaking, reading, writing, and listening module. I have also included some test samples for you to get familiar with the different parts and tasks before you sit for the actual test. I will try to update these samples as regular as possible. I also provide tutoring classes for candidates who are willing to have a good CELPIP score in their test. Please check out my tutoring plans here. Tutoring sessions take place in a practical virtual class where I can share all sorts of files with you. I will guide you step by step towards getting the score you need. I usually provide useful and effective expressions to use in each task, insightful tips on how to avoid mistakes that might make you loose points, and correct and rectify you responses in order to make them sound more organized and structured. Once again, I welcome you all and hope this website will lead you to get a satisfactory CELPIP score. Good Luck! New Android App! Click to download and start practicing! Thank you for using our site and good luck in your test!